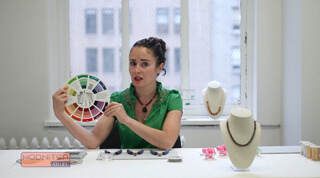 After teaching over 3,000 NYC women how to design jewelry, I'm excited to bring my Beginner and Intermediate Workshops to an online audience. There are 4 workshop sections in my Modnitsa Atelier Online Jewelry Design Intro Series - 2 Beginner and 2 Intermediate Classes - in the same format as they're taught in my studio. I plan to grow and expand my online class selection to reflect my broad jewelry making portfolio. These classes are a perfect way to brush up on what you've learned in my in-person workshops, or learn a new, fun skill. 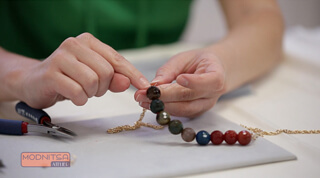 In this introductory Jewelry Design Series, you will learn how to create stunning earrings and necklaces. With unlimited access to class material, broken up into easy to follow steps, you will be introduced to proper construction and design techniques as well as materials and tools and do's and don'ts. Interactive and fun, these courses are meant to spark your creativity and allow you to explore color and style, while perfecting your new hobby. For a limited time only, I'm offering my online video series for only $30 (save $15). Click here to redeem the coupon.